As Ballyduff G.A.A. Club fast approaches its 125th anniversary in 2012, the G.A.A. has never been more a part of Ballyduff than it is today. In those early days Ballyduff contested one of the very first All-Ireland Football Finals, where clubs represented their county. Ballyduff were against Young Ireland’s of Dundalk, representing Co. Louth and narrowly lost out to a better team on the day, which saw 21 players line out on each team! The pitch had four up- right posts at either end, goals were scored between the centre two posts and points between the outer posts. Sounds confusing? It probably was for the 42 players who played on that day in 1887. 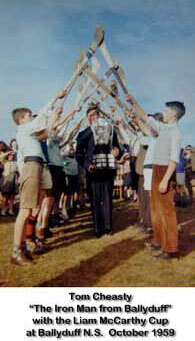 From the 1950s, Ballyduff National School was competing and winning football and hurling competitions. One of our photos shows a 1950s school hurling team, where a few short years earlier Tom Cheasty would have featured in such a photo. Cheasty; ‘The Iron Man from Ballyduff ’ as he was affectionately called throughout the county, still remains our very own hurling hero. He belonged to the 1957 to 1963 era in Waterford hurling which saw the county feature in four All-Ireland Fi- nals; including the now famous 1959 All-Ireland which amazingly went to a replay. On the day of the replay, 4th October, Centre Forward, Tom Cheasty contributed 2–2 out of a Waterford tally of 3–12 to Kilkenny’s 1–10. By the 70s and 80s, both club and school were experiencing success at both hurl- ing and football. They were Junior Football County Champs in the 70s and Junior Hurling Champs in the 80s. Tireless work at school level by Mr. Randal McCarthy, Mr. Declan Comerford R.I.P. and Mr. Pat Flynn ensured that success was never far away. A series of Eastern trophies culminated with the U-13 hurlers being crowned County Champions in 1987 and these were the years when our seven-a-side hurlers fiercely contested the Dunhill Tournament and eventually took home permanently the cup after winning it for a third successive time. Camogie was also begun at Club level and was introduced enthusiastically by Mrs. Ellen Kirby in school. This tradition has continued and we were fortunate in win- ning the County Mini-Sevens Camogie in the late 90s. Two of our players at that time; Elizabeth O’Keeffe and Breda Kennedy represented Waterford in Croke Park as part of the Mini-7s. Ms. Stephanie Maguire has carried on the tradition with our girls in both camogie and Gaelic Football with both her experience and exper- tise. As the new century dawned, a renewed vigour at club level; new faces and new commitment meant that Ballyduff were climbing the division tables and both club and school found themselves competing against the Ballygunners, St. Saviour’s and St. Paul’s among others, not forget- ting that Ballyduff is a small rural community. Breakthroughs in 2009 at U-12 Club Co. Football and wins in U-11 and U-13 school hurling in the past two years, particularly with our U-11 Eastern Co. 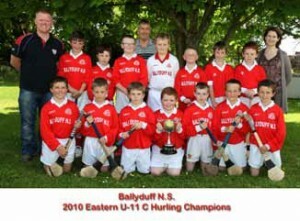 Champs last year, have placed Ballyduff at a new level of competitiveness. Ol- lie Harris as our Club Co-ordinator and Trainer has added greatly to the skill level of all, while Gerry Kennedy has also ‘come on board’ in training and working on team strategy! Mrs. Patricia Power has recently joined the Ballyduff staff and has become part of an ever-growing team of adults dedicated to our boys and girls. The challenge for us all, both Club and school, as we progress on into the second decade of the 21st Century, is to constantly promote, nurture and develop Gaelic Games in our parish of Ballyduff for the benefit of our girls and boys.